7.21.18 Andrés will make his debut with the Dallas Symphony Orchestra conducting three concerts in September of 2018. 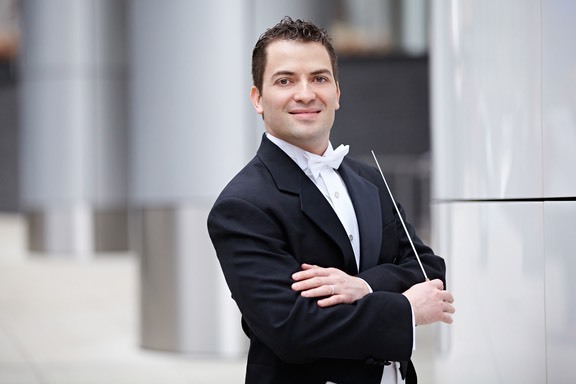 Beginning his fourth season as Music Director of Tulsa’s Signature Symphony and Associate Conductor of the Pittsburgh Symphony, Andrés Franco continues to delight audiences with his imaginative programming and energetic style. Highlights of the 2018/2019 season include debuts with the Dallas Symphony, Omaha Symphony, Wheeling Symphony, and the Round Top Music Festival, as well as return engagements with the Detroit and Houston symphonies. A frequent guest conductor in the U.S., Europe, and South America, Mr. Franco has appeared with the symphonies of Columbus, Fort Worth, Indianapolis, and St. Louis; the philharmonic orchestras of Boise and Oklahoma City; and the Chicago Sinfonietta. Worldwide, he has conducted the Orquesta Sinfónica de Castilla y León/Spain, the Orquesta Sinaloa de las Artes/Mexico, the National Symphony Orchestra of Peru, as well as the Orquesta Sinfónica Nacional, Bogotá Philharmonic, Medellin Philharmonic, and EAFIT Symphony Orchestra in Colombia. He has also appeared at the Cabrillo, Grant Park, OK Mozart, Oregon Bach, and Texas Music festivals. A native of Colombia, Mr. Franco is dedicated to preserving and performing the music of the Americas. As Principal Conductor of Caminos del Inka, he has led many performances of works by Latin American composers, such as Jimmy López, Diego Luzuriaga and the famous Argentine composer Ástor Piazzolla. Andrés Franco formerly served as associate and resident conductor of the Fort Worth Symphony Orchestra, and as Leonard Slatkin’s assistant conductor during the 14th Van Cliburn International Piano Competition. Born into a musical family, Mr. Franco began piano studies with his father, Jorge Franco. An accomplished pianist, he studied with Van Cliburn Gold Medalist Jose Feghali, and attended piano workshops with Rudolph Buchbinder in Switzerland, and Lev Naumov in France. He studied conducting with Marin Alsop, Miguel Harth-Bedoya, Kurt Masur, Gustav Meier, Helmut Rilling, Gerard Schwarz, and Leonard Slatkin. Andrés Franco holds a bachelor’s degree in Piano Performance from the Pontificia Universidad Javeriana in Bogotá, Colombia, as well as master of music degrees in piano performance and conducting from Texas Christian University. He is married to Victoria Luperi, associate principal clarinetist of the Pittsburgh Symphony Orchestra.